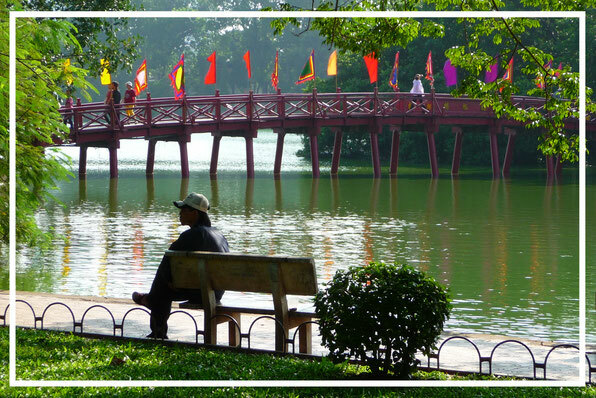 This excursion through Hanoi will take you to the renowned sights and magnificent landmarks of the millennium-old capital of Vietnam. Today, French colonial buildings sit alongside the many shrines and monuments dedicated to Vietnam's first president, Ho Chi Minh. Your day will include stops at Ho Chi Minh's Mausoleum and his former residence, the One-Pillar Pagoda. We will then proceed on to Temple of Literature, which was founded in 1070 in honor of the Chinese philosopher Confucius. This site remains as the birth place of Vietnam's first university. Lunch follows a visit to Quan Thanh temple, one of the 4 sacred temples of the capital. After our stomachs have settled, we will then take a short walk in Hanoi's famous Old Quarters. The streets of the Old Quarter is testament to the historic nature of Vietnam, and takes you back to the days of flourishing trade, centuries ago. This densely populated corner of the city reflects what once was a thriving center of commercial activity in Vietnam, with peculiar street names Sugar Street, Tin Street and Paper Street. Ancient homes and temples are interspersed with stores in this souvenir hunter's paradise!